This weeks post in the Iceland road trip series comes a little late: Saturday was a relaxation day, and Sunday I posted about how relaxing Saturday felt. As such, I didn't put the time to typeset this post until Friday was looming! I think I got a little out of hand adding pictures to this post... But the Mývatn area is impressive and I wanted to show it here. As usual, we got up pretty early, had a good breakfast and headed for the next gas station, which was in front of a local supermarket. Laia got into a wool shopping spree.. Now I have a very nice scarf and half another one in the works. I also bought dried fish, which is (supposedly) a common treat while on the road. It tastes ok, I would have liked it more salty. Close to the supermarket we found a small and cute handcraft store, where we bought several souvenirs for the family and ourselves, made of fish scales (I have a very nice lox keychain) and two leather satchels. A very good place. According to the road map prepared by the lovely people at Nordic Visitor, we should stop midway to visit Sænautasel. Sænautasel is an abandoned farm, rebuilt in 1992. It sprouted into fame with Halldór Laxness' (Icelandic writer, Nobel prize in 1955 – remember this kind of things by reading How to remember facts: associative mental chains) novel A midwinter night on Jökuldalsheiði Moor. When we arrived, it was closed under reforms. We walked around a little, enjoying the fact that it was a mildly sunny day and took the road again. Our next stop was Mödruðalur. A small settlement in the middle of nowhere, has a coffee place and a church built by a local farmer (Jón Stefánsson) in memory of his wife. He is also known for playing Bach in the church's organ... backwards. By the way, have you kept an account of how many coffee places I have talked about? A small gateway to hell (in Icelandic, hell is viti), Hverir is a must-see place, with hot boiling mud and fume escapes, it looks taken from a B-movie showing an alien planet. But it is not. Cover your mouth, the smell can be pretty strong depending on the wind. We arrived to Mývatn shortly, and were impressed again by how open Icelanders are. We arrived to our guesthouse and found the door open. No-one inside, we got out again to get the phone number from our papers, still lying inside the car. Then we saw a paper attached to the front door: Mr. Berenguel, your room is Number 4 and you'll find the keys in the door. Amazing! Hverfjall is a 312 metres high roundish crater, around 1 km in diameter. And a perfect hiking place. There is an easy trail leading you to the top of the crater and you can then circle it. We did not circle it because it was a windy day and we still wanted to walk a little around Mývatn. What we did was signing the guest book... on top of the crater! Unmissable and unforgettable. 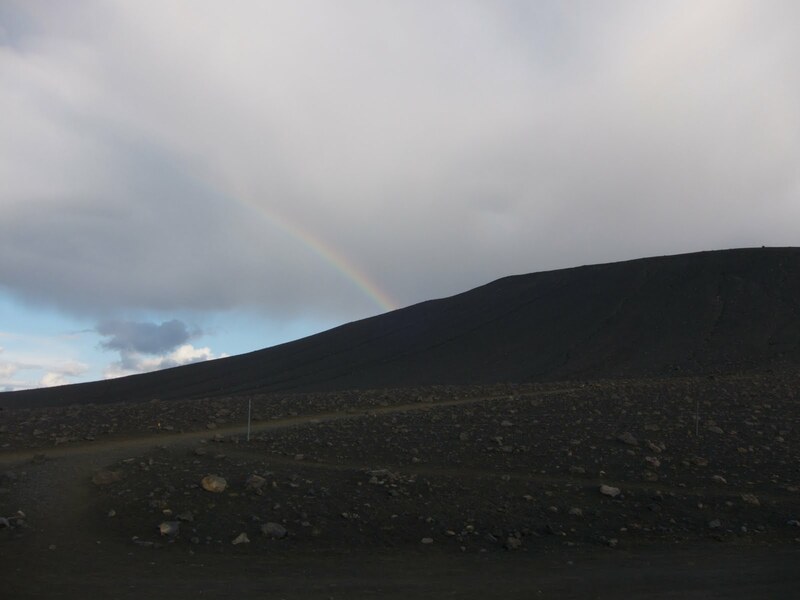 We catched a rainbow landing in Hverfjall. And got amazing views of Skutustaðir's pseudo-craters and the whole lake. Mývatn means "lake of the flies" and as such, it is choking full of tiny flying insects. They don't bite (if I remember correctly, there are no blood sucking insects in Iceland), but they get in your eyes, ears and everywhere. I recommend that you buy somewhere a net to put in your head, or at least take a big translucent handkerchief. You will need it if you get close to the lake. Circling the lake you get views on odd-shaped hills, called pseudo-craters. They look like craters... but they are not. They were formed by water trapped by overflowing magma, when the water passed boiling point, the traps exploded forming craters. As a crater is only so when it is formed by volcanic flow or meteorite impact... they are called pseudo-craters. Do you remember that we could not make it to the Blue Lagoon (Blaá Lónið) near Reykjavik? Well, Jose back in Hoffell told us not to despair and rush the last day, and go to Mývatn Nature Baths instead. In broad terms, it is exactly the same. The escape water of a geothermal power station collect a lot of sillica and an odd-blue alga that it is pretty good for your skin. And you can go there and enjoy a hot smooth bath in the middle of a volcanic desert. It is truly an amazing experience, I don't know about the Blue Lagoon, but we can truly recommend Mývatn Nature Baths. The visit is only 2500 ISK. And today.... Record day if I'm not mistaken: 1541 km! Arnor Heiðar Sigurðsson pointed my mistake here... This distance is the same as Reykjavik-Egilsstaðir-Reykjavik. This 1541 are probably for the previous 2-3 days, we forgot to re-start the kilometer counter.